These comments irked many Tweeters, who weren't about to take them sitting down. Or they were going to take them sitting down, but not without lobbing a hashtag at Franzen. So the author has since gotten some hate tweets on #JonathanFranzenHates. Yesterday Sasha Frere-Jones launched a spirited defense of Twitter on the New Yorker's blog. Frere-Jones, pop-music critic for the magazine, noted Franzen's criticisms, and others about Twitter, and dismissed them one by one. 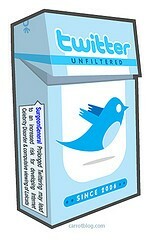 I know Twitter has its devotees, some of whom are addicted to it—but I remain a skeptic. I use it mainly to send out links to stories. I've recounted the great Twitter cultural contributions made by parking garages and pro athletes. I found Frere-Jones's case for Twitter strained and unconvincing. The issue isn't fungible goods, though, but finite ones, like time and energy. There are only so many hours in the day. I find myself spending more of them on Facebook or the Web, and occasionally Twitter, and fewer of them on books. There's an ongoing temptation to fill cracks in the schedule with the bite-size morsels that are just a click away. Books may not be replaceable, but they're displaceable. Frere-Jones reminded us that four years ago, after the New York Times Magazine published a cover story by Emily Gould about her blogging, many commenters expressed concerns that such stories might supplant worthier ones. But last Sunday's NYT magazine carried stories about gambling, silence, and China, Frere-Jones wrote—so "this fear seems to have been groundless." Groundless, because of an issue of the NYT magazine! Perhaps a New Yorker forgets this, but if journalism falls, the Times likely will be the last one standing. What the NYT still manages to do is hardly a trustworthy measure for the status of the business or the impact on it of new media. Frere-Jones likes the increased occasions of immediate news reporting that Twitter provides. He cited the emergency landing of US Airways Flight 1549 on the Hudson River in January 2009 as an example—he learned about it first from friends with views of the river who tweeted it. As it turned out, "the amateurs had not gotten it wrong," he wrote; "a goddamned plane had landed in the goddamned Hudson." Getting this news first on Twitter "won’t necessarily enhance the historical record," Frere-Jones allowed, "but it did enhance the moment, and I am not above that kind of adrenaline Scooby Snack." I wouldn't deign to deprive people of their Scooby Snacks. But there's a downside to this immediacy, as Frere-Jones conceded—it gives birth to many falsehoods. Twitter, however, is also where those falsehoods first are shot down, he said: "It’s sort of a self-cleaning oven." Which is only a problem for those stained by the initial mess. Frere-Jones rhapsodized about the creative new stuff engendered by Twitter—poetic spambots, witticisms (“HOW DO YOU TURN OFF CAPS LOCK” followed by “OK AWESOME I THINK I FIGURED OUT HOW TO TURN OFF CAPS LOCK”), the entire English language tweeted a word at a time. If this sounds like ephemera, Frere-Jones said, Twitter is deeper than that: consider that all 112,000 lines of Shakespeare are being ported on to Twitter, line by line. Great way to read Shakespeare, yes? Frere-Jones was ready for naysayers: "All of these sentences, stripped of context, reveal strengths that are washed over when taken up in the river of narrative." And why spend all that time swimming in a river of narrative when you can dab your toe in a Twitter puddle?